1. We do not recommend the projector for Word or spreadsheet, this is not Professional education projector. 2. If you need a louder sound, an External Speaker must be required. HIGH PERFORMANCE PROJECTOR - LED Luminous efficiency, 4.0'' LCD TFT panel, supports full HD-Level 1080P, 800*480 native resolution, Aspect ratio: 16:9 / 4:3, which can make you obtain best user experience. NOT recommended for PPT or business or teaching presentation. 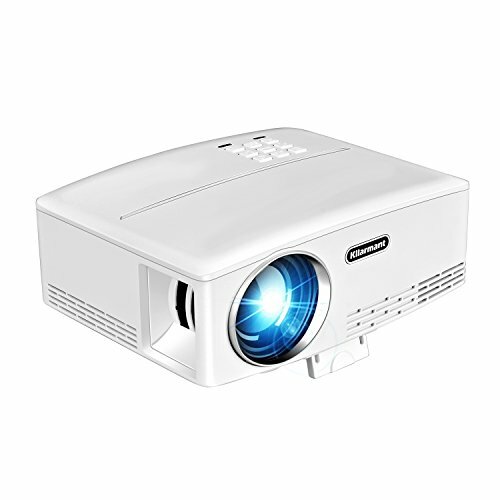 PORTABLE PROJECTOR - Small size and light weight of this home theater projector enables you to take it to anywhere you want. has a foldable holder in the bottom, you can be adjusted according to your needs. easy to take it out and enjoy your outdoor party. BUILT-IN SPEAKERS - Built-in stereo speakers (4Ω,5W) with SRS Sound, makes the voice more powerful and fidelity, SRS is currently the best sound technology. you can also connect with external audio device for better sound performance. LONG USING TIME - The LED light source consumes less energy than traditional lamp-based projectors and is mercury free. It offers up to 30,000 hours lamp life and color loss very slowly, which means it can last for more than 20 years (4 hours a day). no need to replace the bulb. If you have any questions about this product by Kllarmant, contact us by completing and submitting the form below. If you are looking for a specif part number, please include it with your message.